Matador’s current Road Warrior, Norbert Figueroa, takes a basket weaving lesson in Belize. “I’LL TEACH YOU HOW TO MAKE BASKET”, says Maria Ack as I enter her small wooden home in the Maya village of San Miguel, located in the Toledo District of Belize. Maria is one of the many women who practices the art of basket weaving to conserve that important cultural aspect and to make a living by selling them to locals and visitor alike. “Sit here”, she says, pointing to a low stool located next to a table with a few green and dry palm-tree looking leaves. As she picks one of the green leaves from the table, she says: “You see how I make basket”. The Jippi Jappa plant looks like a hybrid between a palm tree and a small decorative plant. The Jippi Jappa palm grows wild in the rainforest and often in abandoned fields. It is also very common in Maya villages. For a light colored basket, the leaves used are the ones that are still in the heart (still closed). For the dark baskets, the open green leaves are used. Each big leaf is composed of many pointy smaller leaves. Those smaller leaves all have a central core that gives them their rigidity. Insert a knife through that central core to strip it out, leaving only the fiber, or the soft part of the leaf. This is done for both light and dark basket leaves. Tie the light fibers by the ends in small groups of six to eight. The green fibers will have the leaf base holding them together, so just split them in smaller groups of six to eight fibers too. Boiling the light fibers for 10 minutes will prevent them from rotting. It also gives them their typical beige color and softens them, making them easier to bend without breaking. After cooking, wash them with soap and let them dry for two days if the weather is sunny, or more if it’s overcast. The green fibers are not cooked; they are just left to dry for 2 ½ days. 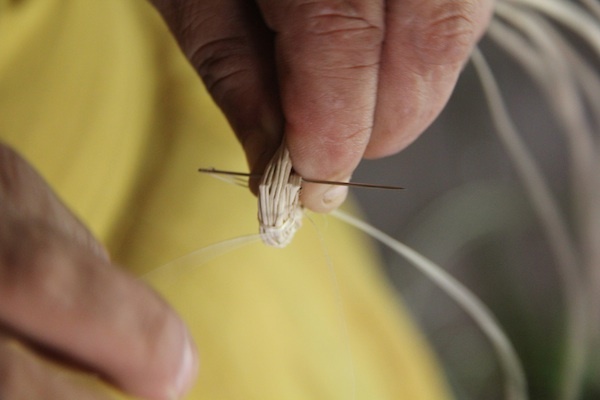 To start weaving, first pick the desired dry fiber color (light or dark) and stretch it as if it was a rope. Form a small coil at one of its ends, insert a needle with a string, and loop around the coil to saw it in place. 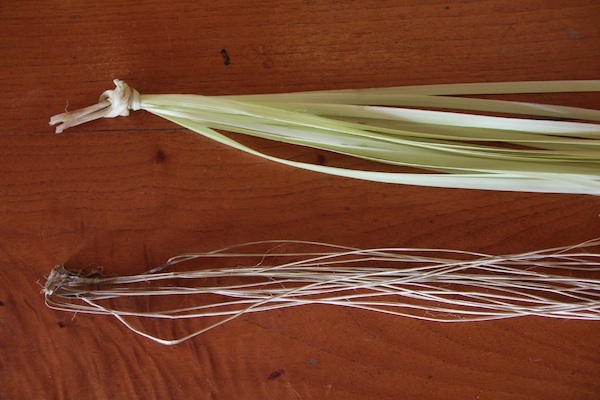 The string is made out of Heniken, which is taken out of the Bromelia plant and goes through the same process as the Jippi Jappa leaves (stripping, boiling, drying). The difference is that the Heniken dries in a thinner, string-like shape. If Heniken is not available, the same Jippi Jappa leaves can be used, but cut into strips thin enough to fit into a needle head when dry. 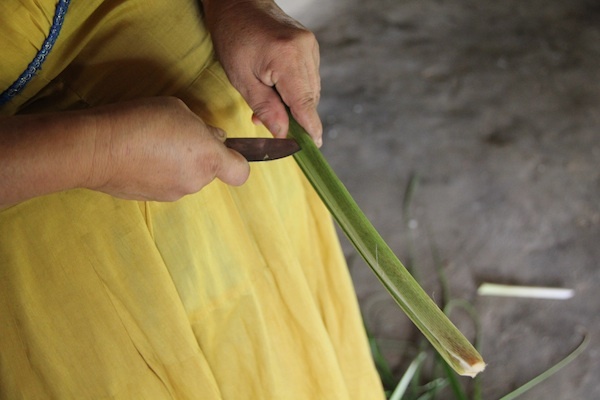 Today they use steel needles, but in the past, Maya women used spines from trees as needles. Repeat the sawing process by inserting the needle approximately every quarter inch, always pinching part of the previous layer of the coil to hold the outer layer in place. Keep expanding the coil until you achieve the desired size of the bottom of the basket. To make the sides, or give the “basket shape”, weave the strings of the coil in a diagonal or vertical location in relation to the previous coil layer. When the length of the fibers runs out, attach the next bundle of fibers to the end to extend the rope-like shape almost seamlessly. When desired, the colors of the fibers can be changed to create design patterns. This sawing process may take anywhere from a day for small baskets to a week for bigger baskets. Once finished, place the basket under the sun for a day to make sure it is fully dry before using.